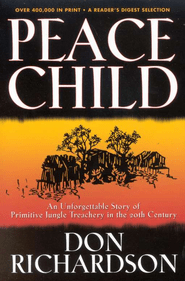 It was over 20 years ago that we first read Peace Child. In this book, Don Richardson tells the story of his encounter with an unreached people group in the early 1960s. In 1962, Richardson, his wife Carol and their 7 month old son arrived in what was then known as Dutch New Guinea, to begin work among a violent, cannibalistic, head hunting tribe called the Sawi. The task before them was great because the Sawi language did not exist in any written form. They would have to learn the language by living with the people and slowly accumulate a vocabulary while at the same time giving the language a written form. This was difficult, discouraging and time consuming work but necessary before they could even begin to translate Scripture into the Sawi language for evangelism. Their task was complicated by the constant tribal wars that kept the young missionary family in a continual state of danger. Not only was their task complicated by danger, but even after Don had reached a level of proficiency in the tribal language, so that he was able to present the story of the betrayal and crucifixion of Jesus, he was confronted with a seemingly insurmountable problem involving their perverted system of moral values. A world view that made Judas Iscariot the hero of the crucifixion story. Frustrated by their lack of progress in seeing conversions take place among the Sawi and frightened by the continual warfare that threatened the safety of his young family, Don issued an ultimatum: Either the fighting would stop or Don would take his family and leave. Because they valued the medical care provided by the Richardsons so highly, the Sawi took the dramatic step of ending the fighting. Unbeknownst to the missionary, the Sawi had a tradition that if warring tribes were going to enter into a peace treaty, then one of the tribes would have to give an infant from their tribe to their mortal enemies. After observing the ceremony that included the giving of the infant, known as the “peace child” to their enemies, Don knew he had at last had an open door to communicate the gospel. As soon as he could he gathered the tribe together and told them of how though they were enemies of God because of their sin, God had given his only Son as a “peace child” to make peace with his enemies. These verses form an important postscript to Jesus’ teaching on prayer in verses 13 and 14 (the Lord’s Prayer). A postscript is the P. S. placed at the bottom of a letter which adds a note to the end of the letter after the signature. Sometimes these postscripts are trivial in our letters, but not this one. Jesus is adding an important word regarding the fifth petition in the Lord’s Prayer, the petition regarding forgiveness. Jesus had said that we should pray for forgiveness of our debts “as we also have forgiven our debtors.” Obviously there is some link between the forgiveness that we wish to experience and the forgiveness which we show to others. Jesus explains further in verses 14 and 15 (see above). Frankly, Jesus’ explanation does not make the text any easier. In fact, it is now much harder. Jesus says that if we forgive others, we will be forgiven by our heavenly Father. But if we fail to forgive others, we will not be forgiven. What does this mean? Well, it certainly means no less than to say that forgiving people are forgiven people and unforgiving people are unforgiven people. I believe that Jesus is saying that the one who has truly experienced forgiveness has experienced such a work of God’s grace in their own life that they will be a forgiving person. They will understand that they have been forgiven an infinite debt which they owed to a holy God, and therefore they will be willing to forgive the small debt in comparison which others owe them. But those who will not forgive others give evidence that they have not truly experienced the forgiveness which God gives. They have never come to understand their sinfulness and need of grace, for if they had they would not be so reluctant to forgive the weaknesses of others.